Several treats today! I will tell you what, you want to have great experiences, meet the right people. I've had the good fortune in the last few days to bump shoulders with a few people that, at least in my little world, are big stuff. First, let's start with a four minute video featuring what I thought was the most difficult obstacle in the icefall, the three horizontal ladders, which only appeared late in the season, sometime after May 10th. It was difficult because the safety ropes were not totally parallel to the ladders, and there was a ice block halfway through that was pushing you to the left on the way down. It's not that difficult, it took me all of 17 seconds to walk across it, but some part of the ice fall has to be the most difficult. Next we had the 9th International Sagarmatha Day this morning, where I gave a speech in front of Nepal's Prime Minister, the Minister of Tourism, and maybe 400 other people including Russell Brice. Ang Tshering, president of the Nepal Mountaineering Association, asked me Friday night if I would please give a speech at the event since I had summited and they wanted an international guest to say something. He also asked that I give a recommendation or suggestion for how to improve Mt. Everest. I was dubious that this would all come together and I would actually give a speech, but I thought about it on Saturday and came up with a few words to say if it actually happened. We met at 7 AM in front of all the official gear shops like Mountain Hardware and The North Face in Thamel before a short parade over to the Ministry of Tourism. Funny enough, turns out they even had my name in the official program. Yep, looks like I was going to get to speak after all. 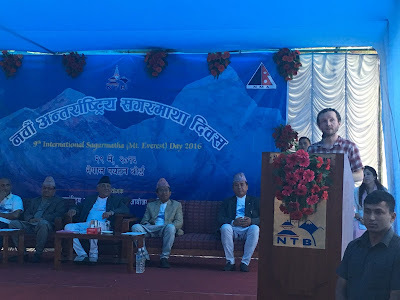 I thanked the guests, specifically those sitting on stage by name, and all the people for attending, and I thanked the high altitude workers like Sherpas, guides, cooks, and porters that make this whole industry possible and accessible to individuals. Then I briefly described my summit experience, the feeling that we don't belong at the summit and our time there is temporary, so we need to take care of our home, the places we live because the world is not unlimited. Then I suggested that if the tallest mountain in the world was in the USA the National Park Service would fix the ropes from basecamp to the summit, and perhaps that was something that the SPCC (Sagarmatha Pollution Control Council aka Ice Fall Doctors) could do in the future. In fact, it already happens on the Chinese side of the mountain. Pasang Sherpa, one of the Sherpas that fixed the ropes from camp 4 to the summit gave several suggestions, and that was also one of his suggestions. Good to know we are on the same page. Next, since not all the fun happens during the day, Saturday night I had dinner with the Iranians, and some Adventure Consultants people including the famous Ang Dorjee. Yes, in the movie Everest, Guy Cotter is yelling into the radio at Ang Dorjee, that Ang Dorjee. 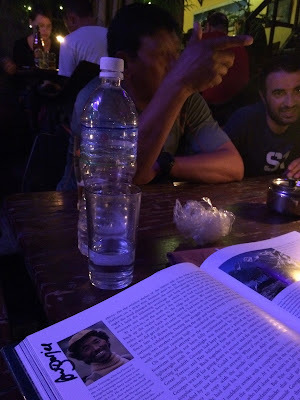 We made our way to Tom and Jerry's and I asked Ang Dorjee what was the most difficult time he had in the mountains, I mean with 21 Everest expeditions, 18 summits, and just about every other big mountain around the world, he had to have a rough go of it at least once. Turns out he was stuck with Scott Fisher and five other people at camp 3 (7000 meters) on Broad Peak in 1995 for seven days in a terrible storm, so back they could not unzip the tents, and the tents flattened on them many times. They ran out of food. They were low on gas and were measuring out water in a cup so that everyone had the same few ounces. Finally they walked down, with the storm still going, and Ang Dorjee leading the way. He even triggered an avalanche below camp 1. Fortunately, they all survived. It actually provides a little more context to the 1996 incident. He is working on a book and I encouraged him several times to follow through with it. Two years ago I bought Tenzing Norgay's book, yesterday I bought Jamling Norgay's book, maybe in two years I will buy Ang Dorjee's book. Frankly, I can't wait to read about the 1995 Broad Peak storm. Not enough Sherpas write books, I want to hear their side of the story. 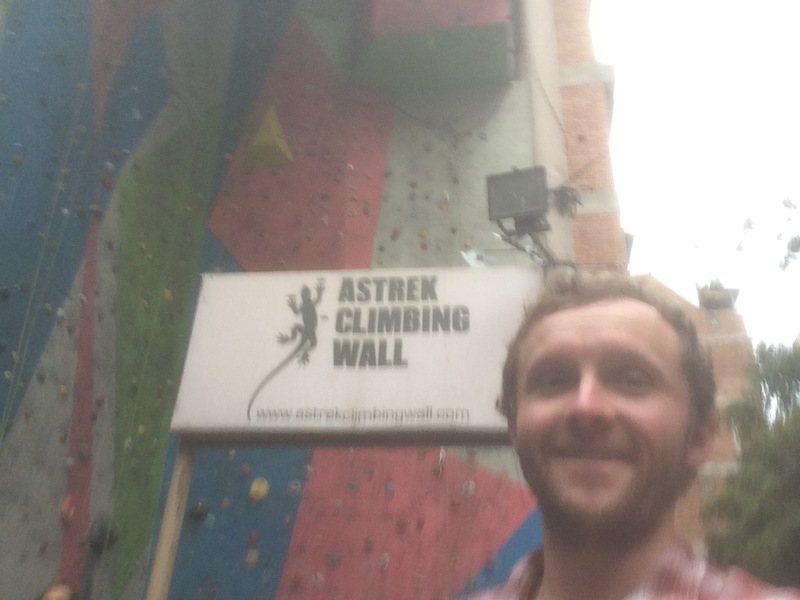 Finally, if you are in Kathmandu, and you are a rock climber, you really ought to stop by the Astrek climbing wall in Thamel and take a few laps. I borrowed some shoes from Niraj the manager and Nepali rock climbing champion Saturday afternoon and bouldered until I had a couple blisters on my hands. I'm going to give up on selfies. In other news I am coming home a few days earlier than planned and will arrive in Chicago around 10 AM Tuesday, May 31st.